We have just secured USD$50M in our Series B investment round from Insight Venture Partners. Insight is a top-tier US investment firm that has backed numerous multi-billion dollar success stories including Alibaba, Twitter, and Shopify. They are investing in 1Tap (by Receipt Bank) because they can see how our technology is genuinely automating away the dreary and boring parts of being self-employed. This is an insanely exciting period for us. We now have the means to make this revolution a reality even faster. Since our launch in May last year, we’ve partnered with over 60,000 self-employed people and their UK businesses. So what does our cash injection mean to our users? A lot actually. We will be using the investment raised to take 1Tap Receipts global, with the aim of establishing ourselves as the number one platform for the self-employed to automate their finances. We’ll be heading to Europe first whilst growing our community of 60,000 users across the UK! There is also a tonne of new features in the pipeline that will make managing your finances even easier. 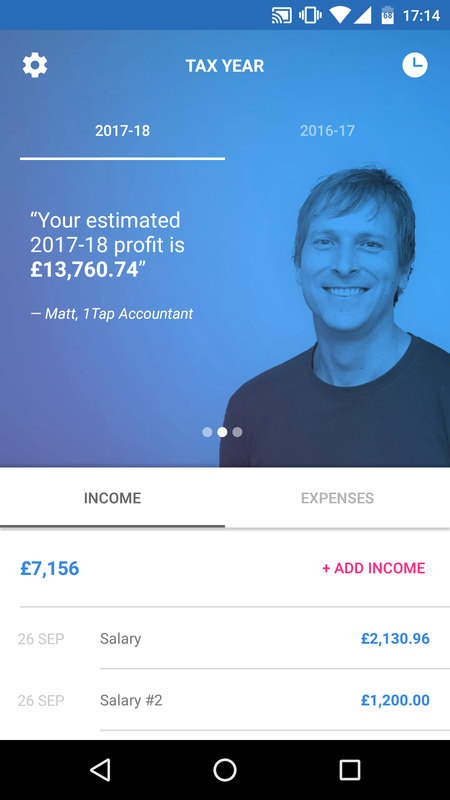 Soon you’ll be able to use 1Tap from your desktop, able to start keeping track of your income in 1Tap. 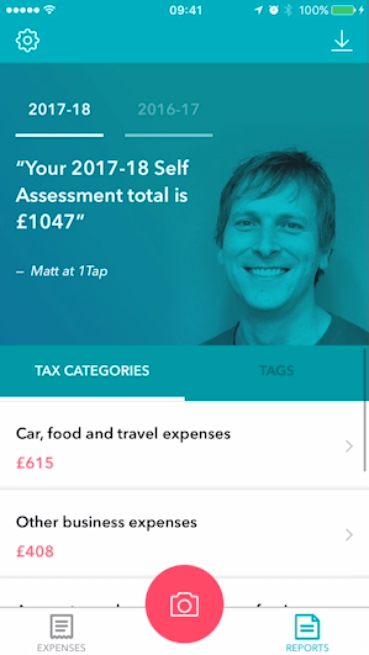 We’re launching 1Tap Tax, an app complementary to 1Tap Receipts which will automate your income record keeping. It’s a big deal. Together with 1Tap Receipts, you’ll be able to know exactly how much tax you owe at any point in time. If you would like to get early access to 1Tap Tax let us know and apply here. We’re also making 1Tap Receipts stronger. For each receipt you add into 1Tap, the app will automatically create tags so you won’t have to. Together with the upcoming search feature, you’ll be able to find any receipt in just a couple of taps. Brilliant not only in the event of an audit but just plain useful if you need to make a warranty claim. Automatic bank feeds. 1Tap Receipts will integrate with banks, which will enable you to access your bank transactions through the app. Imagine you use your bank card to pay for the metro. This transaction will show in 1Tap, where you will select the item and mark it as a business expense. This incredible tool will ensure all your card purchases for work will be claimed in a single tap. We’re always on the lookout for feedback on which features you would like us to add next. Let us know via our Community page now. These are just the some of the major improvements coming up. Our teams are getting bigger by the week, and we’re all super passionate and truly working hard to make 1Tap the market leader in automated bookkeeping for the self-employed. We believe we can do it, we’ve got the talent and the drive to aim for the sky. This revolution IS happening but it won’t happen on its own. We ask you to continue waving your flags for us, spread the word about 1Tap. Tell your fellow self-employed friends about us and rate the app on Google Play and Apple App Stores and spread the news on Facebook and LinkedIn. The world is listening. We have to go back to work now.